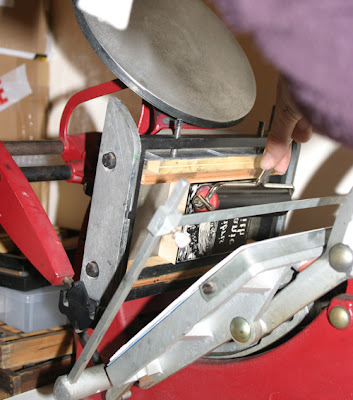 Last week the Adana came in for some heavy use as we printed a run of 50 bookplates on it. These were a commission for a Christmas gift (hence the photo doesn't give too much away!) It took a fair bit of trial and error (as usual) to get the right consistency of ink, but though it was a fiddle to get the roller to it once the chase was set in the press, it was much quicker than burnishing by hand. Having the press in the upstairs boxroom makes for cramped working conditions, but the toilet does sterling work as an inking table (as long as the lid's down). We also got round to printing the St Winifred's engraving at long last! You can see it on our Flickr page. And last of all, we got our Christmas tree up! All seven feet of it! You can watch us in action below! 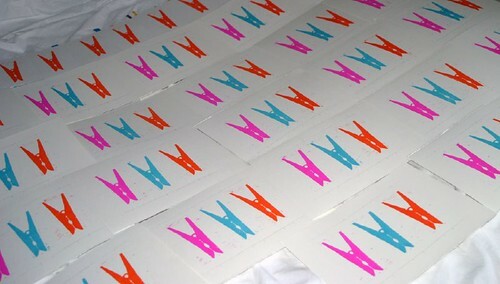 The first stage in my new reduction wood cut of three brightly coloured pegs. I've printed all the peg shapes in orange, pink and blue - now I just need to add the metal hinge with the new silver printing ink. I made some notecards with the same peg block, and the silver ink works really well on them. Sadly there's no sunshine in Norwich today, and it's too dark to take a proper photograph - I'll add some more when the prints themselves are finished and it's a sunny day! This evening we are printing a commissioned bookplate on the Adana - Jon is sitting on the floor packing the chase with bits of wood as I type. The fourth part in our erratic series of favourites. Today, some lovely end-grain wood blocks. 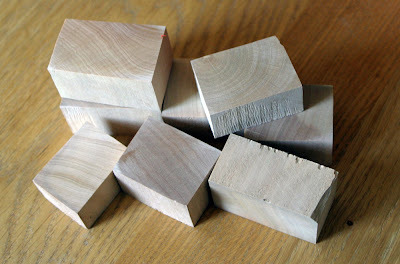 We have lots of blocks waiting to be engraved, in all shapes and sizes. Below is a random assortment of tiny blocks, never measuring more than 2 x 3 inches. We also like to engrave on Resingrave, a synthetic material designed to imitate boxwood. I love the pristine white top layer before a block is engraved - always completely smooth and cool to the touch. Next, a maple block. This one measures 3 x 5 inches, and is made up of several smaller blocks joined together. Below is one of our precious boxwood blocks, from Chris Daunt, one of the last suppliers of handmade wood engraving blocks in the UK. 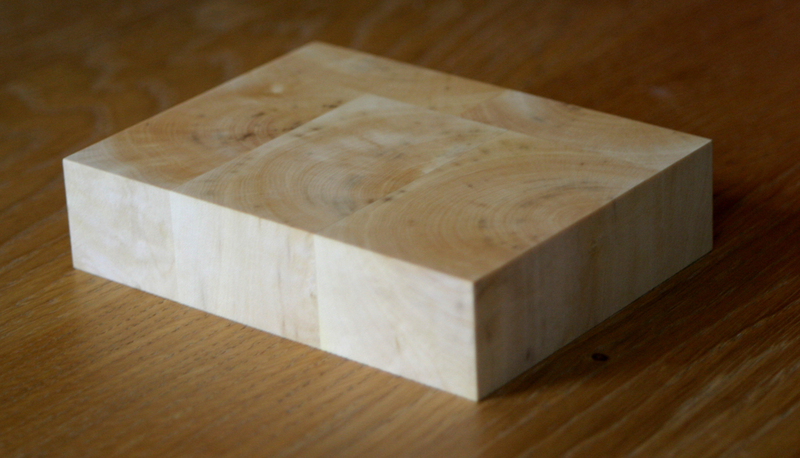 If you ever hold a boxwood block in your hands then you'll know why it is such a highly prized wood. Boxwood feels completely different from any other wood, and the blocks are utterly beautiful in their own right, without any additions from us! 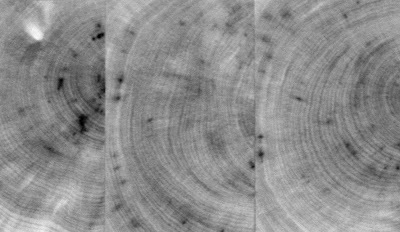 Below is a close-up of the grain of the same boxwood block. This weekend we have both been doing lots of cutting! We both find cutting to be quite therapeutic, especially with a glass (or two) of sherry and a favourite CD in the background. 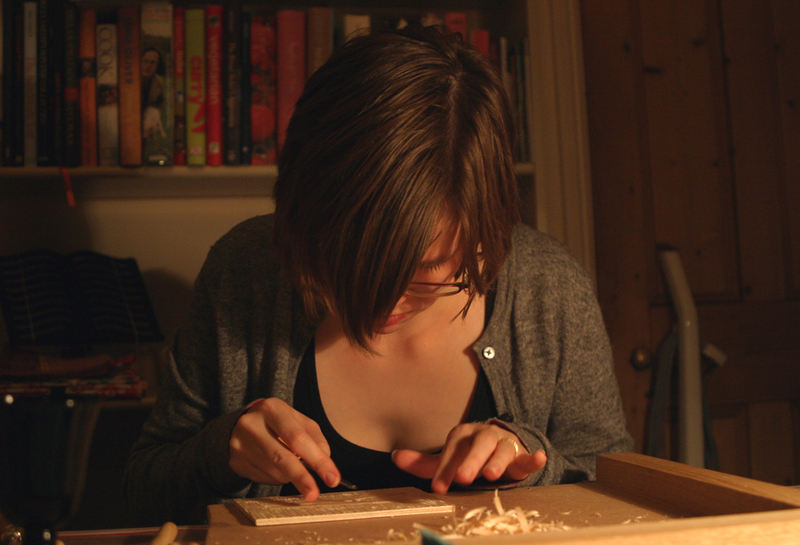 After a couple of weeks of day-job related upheaval we both needed to sit down quietly and do some cutting! I have been working on a new wood block of a wooden peg which is now ready to print. I used one of my new tools, which was very pleasing to use and puts my old blunt ones to shame. 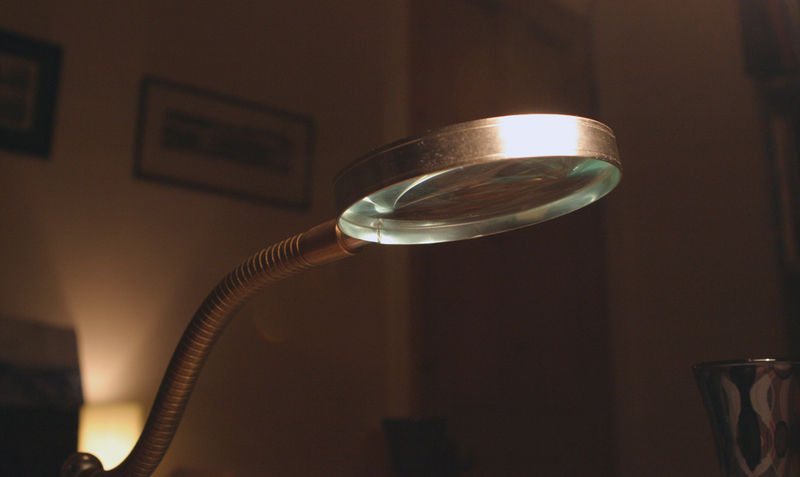 Jon has been busily engraving for a commission for a surprise present, so instead of a photo of his current block here is a photo of his magnifying glass. Useful for engraving and setting fire to small bits of paper when the sun is in the right place.